This Slow Cooker Salty Party Mix can be made right in your slow cooker! Don’t worry about turning on the oven or watching the timer every 15 minutes! Who can pass up a good party mix? This one may take a little longer to make than what you are used to, but the beauty of making party mix in your slow cooker is that you can pretty much ignore it all afternoon. And then just dig in! I almost always make the traditional Chex Mix, but add some extra seasonings and butter. And I make it the “old-fashioned” way – in the oven, stirring every 15 minutes. This one came out so yummy, I will be adding this into the rotation! With a busy toddler who always wants to help, opening the oven every 15 minutes is a recipe for a burn. So I am branching out. 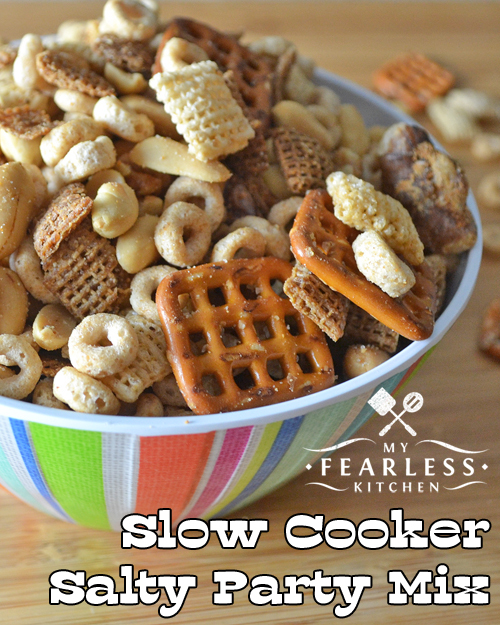 I tried this Slow-Cooker Salty Party Mix from “Slow-Cooker Fall Favorites” by Gooseberry Patch. It’s a hit! This recipe has celery salt, which I hadn’t thought to try in party mix before. It adds a nice little zing that I wasn’t expecting! **PRO TIP – I didn’t actually have any celery salt. So I substituted 1/2 tsp celery seed + 1/2 tsp salt for 1 tsp celery salt. Perfect. Can You Make Chex Mix in a Slow Cooker? I love how this bakes up right in your slow cooker. No need to turn on the oven! No need to watch the clock and stir every 15 minutes! I did pop the lid off and give it a quick stir about once an hour. Old habits die hard, I suppose. I will say, this recipe just barely fit in my 6-quart slow cooker. (That’s part of why I stirred every hour.) Next time I will combine everything in a (very) large bowl before I put it in the slow cooker. But it was manageable. And the seasonings and butter did get mixed well in the slow cooker. What is your favorite party mix recipe? 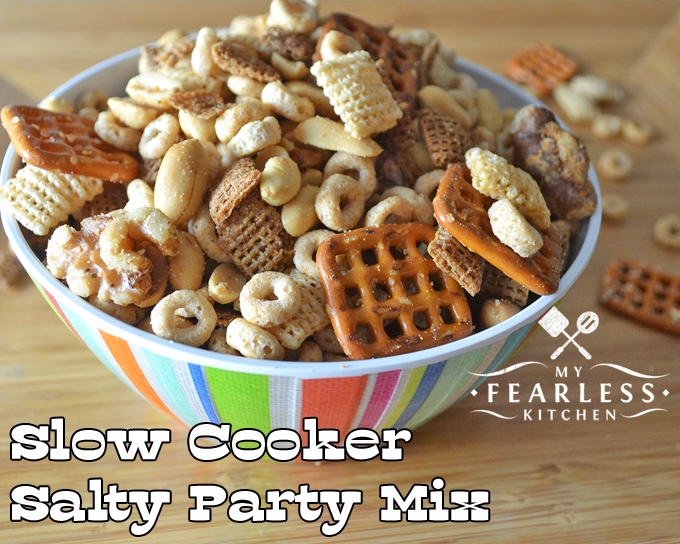 This Salty Party Mix can be made right in your slow cooker! Don't worry about turning on the oven or watching the timer every 15 minutes! Combine cereals, pretzels, nuts, seasonings, and cheese in a large bowl. Drizzle melted butter over cereal mixture; stir to coat well. Transfer cereal mixture to a 6-quart slow cooker. Cover and cook on low for 3-3.5 hours. Remove lid and cook on low setting for 30 minutes more. Cool on paper towels. Store in an airtight container.